Here is my confession – Even though I am an avid mountain biker and hiker, for the first two years I was Director at the C.H. 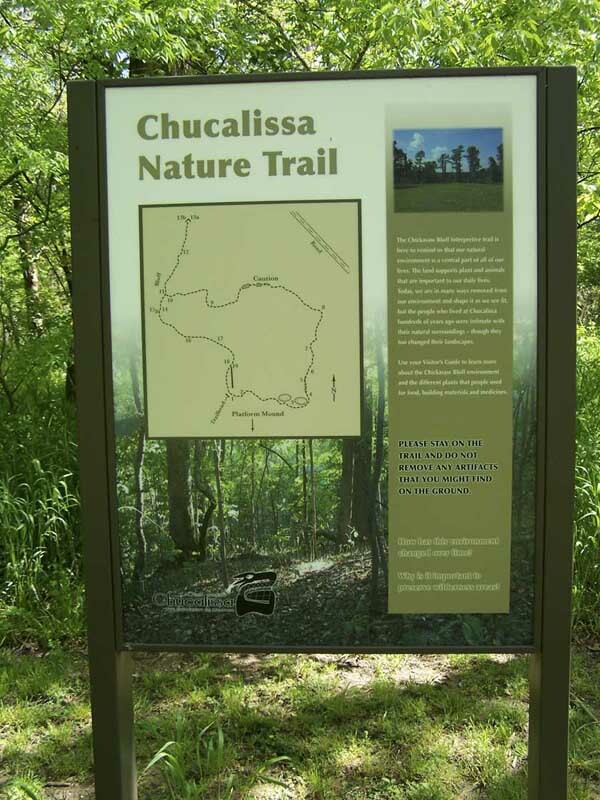 Nash Museum at Chucalissa, I doubt I walked our 0.5 mile nature trail more than once every 3 or 4 months. I was fixated on the upgrades needed to our museum building’s programs and exhibits. After my first year as Director, with the economic downturn in full swing, I was more obsessed with balancing ledgers than the great outdoors. Over the past two years. I began paying more attention to the portion of our museum beyond the building walls – less from my initiative than that of others. For example, in 2009, after several years of work by the Southwind Garden Club, the Chucalissa arboretum was officially certified. For years the Club landscaped the front of our museum but now ventured to the wooded area beyond the manicured earthwork complex. In 2009 as well, James Beard of the Friends of T.O. Fuller State Park linked our 0.5 mile nature trail with the 6.0 mile trail of the adjacent State Park. A hike along the trail with James that summer opened my eyes to the fantastic resource the Museum shared with the State Park. That year as well, Chris Cosby, then a Graduate Assistant from the University of Memphis, completed a floristic inventory identifying and creating a photographic database of the plants growing along our 0.5 mile trail system. Last year for an internship in the University of Memphis Museum Studies Graduate Certificate Program, William DeVore refurbished our Sinti Herb Garden and created signage and an educational brochure for the space. More recently, local herbalist Glinda Watts and Graduate Assistant Megan Keener initiated a sweetgrass bed and plans for a Traditional Medicinal Plant Sanctuary along the Chucalissa Nature Trail. We have submitted grant requests to fund this project. The long and short of all this is that through the initiative of others, I have come to better understand how the natural environment fits into our Mission Statement and also how visitors appreciate this very important part of our museum resource. In a recent readership survey of our monthly e-newsletter Chucalissa Anoachi, nearly 60% of the respondents asked that we prioritize the programming in our natural environment. That result was surprising to me at first . . . but I should have noted that besides anecdotal comments from visitors, our greatest Facebook feedback comes from posts about the herb garden and hiking trails. As well, being out in the plaza and throwing darts with the atlatl is a favored activity of visitors, volunteers, and staff regardless of the summer heat. We have also gotten very strong marks from our visitors with our recycling program. As I noted in an earlier post, such programmatic changes for our museum should not be driven solely on a desire for increased attendance or responding to visitor requests. If that were so, we would open exhibits containing human remains, something that holds a fascination for some visitors despite the ethical and legal implications. Rather, incorporating the natural environment into our programs fits well into our mission statement. Our lack of attention to these elements in the past reflects a missed opportunity. In the same way that we now have a hands-on archaeology lab exhibit to give youth a tactile experience of prehistoric cultural materials, as participants in the Let’s Move Museums and Gardens initiative sponsored by the Institute of Museum and Library Services, we have opportunities to give youth a hands on experience in the cultural and natural environment outside our building doors. And in the same way that we highlight the humanities of the traditional cultures inside our museum walls, we can take those expressions outside such as the trail poetry at the Audubon Zoo in New Orleans. I am left with realizing that such changes are not a matter of following the latest fad or attendance/revenue generating concept but rather being vigilant for new and inspiring ways to live into our existing Mission Statement. What parts of your museum or site can you incorporate into programs and exhibits to more completely live into your mission?